Good morning, and Happy April Fools day! Be on guard from any practical jokers trying to get you on this day of creativity. Today is a good day to go and drive Jeeps on the beach. 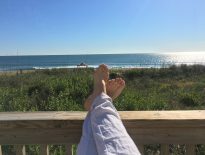 Keep in mind it is permissible to drive your vehicle on the beach on the Outer Banks during certain times of the year, but there are rules that apply depending on where you drive. If you drive on the beach in Currituck County there is a permit is required to drive and park on the beach. The sheriff’s office will and has enforced this rule now since May of last year. On the beaches of Cape Hatteras National Seashore a permit is also required to drive on the beach. These are sold by the National Park Service each year. On the beaches of Nags Head and Kill Devil Hills seasonal beach driving is permitted (Before Memorial Day and after Labor Day) each year. A permit is required, and certain areas are off limits. Beach driving is not permitted in the towns of Duck, Southern Shores, or Kitty Hawk. Driving on the beach is fun! All of that brings us to this week’s Memory Monday photo submission. 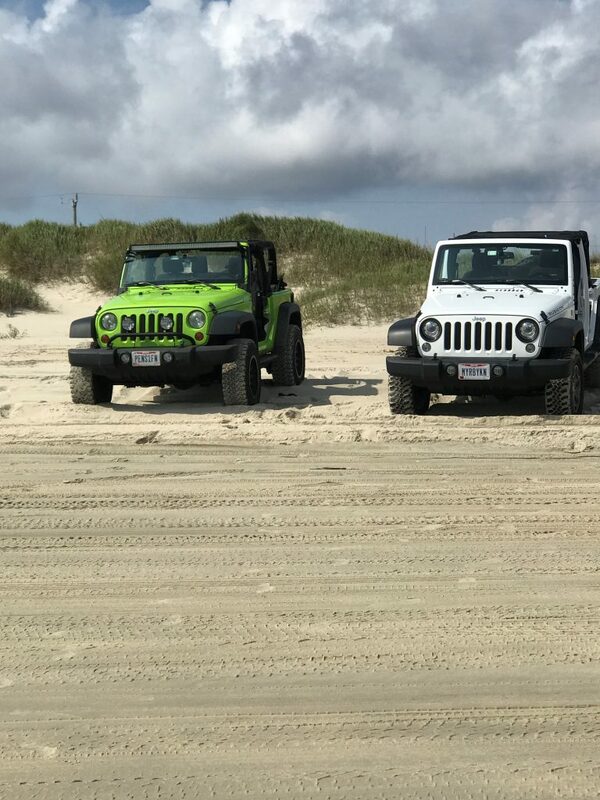 It comes to us from Becky Hale who stayed with Blue last fall, and her crew took their Jeeps out on the beach during their stay. We think this picture was taken in the 4 wheel drive area of Carova (north of Corolla). That area is one of the most popular areas to drive on the beach due to the wild horses that roam the area, and the relatively hard pack on the sand from so many vehicles going back and forth. If you do not have a 4 wheel drive vehicle you are not out of luck. You can still enjoy a day on the sand by renting a vehicle for the day. Check out “outer banks jeep rentals” on Google to get a full rundown on the companies that provide this service. Oh, and please don’t forget to let some air out of your tires before you go on the beach….it will make driving on the beach a lot easier! 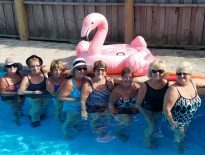 Thanks to Becky for her Memory Monday photo, and All the best from the beach.